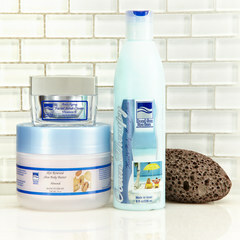 The moisturizing scrub set includes both kinds of our body moisturizers, our Shea Butter and Body Lotion. While in the shower, massage those dry skin, rough areas with our pumice stone. Afterwards you can use the Hand and Body Massage lotion all over your body and the Shea Body Butter on the dry skin parts for that extra moisturizing. Shea Body Butter has been known for centuries worldwide as one of nature's greatest moisturizers, especially for people with skin problems or dry skin. Take the time to treat those extra dry spots like your heels, elbows and knees with Dead Sea Spa Care Shea Body Butter, for the shea butter will leave even the driest skin silky soft and smooth. Your dry skin will thank you. These wonderful Dead Sea products, natural humectants plus the minerals from the Dead Sea intensify cell regeneration, leaving your skin instantly silky smooth and soft, not oily and greasy like other hand cream. The Dead Sea Spa Care Hand and Body Massage Lotion is formulated to soften even the driest skin, an delivers long-lasting moisture. Our Dead Sea Spa Care Anti-Aging Facial Scrub Cream is a wonderful facial scrub cream for cleansing your skin. 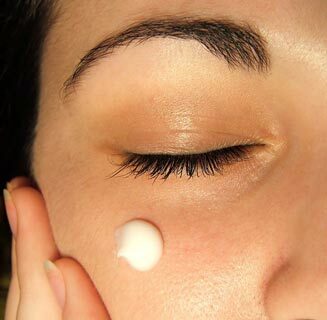 Dead Sea Spa Care Anti-Aging Facial Scrub Cream is specially formulated with Dead Sea Minerals, Shea Butter and Vitamin E, which are known to be powerful anti-oxidants and skin strengthening natural ingredients to nourish and moisten your skin facial treatments. This Dead Sea facial cleansing product contains mild granules that gently exfoliate the facial skin clean of dead skin cells, dirt and oil, while leaving the skin moisturized and smooth after this facial treatments. The gentle blend of rejuvenating Dead Sea minerals and beneficial properties of the Dead Sea allows for fresh and radiant beautiful skin to emerge. The Dead Sea Spa Care Anti-Aging Facial Scrub Cream is made in Israel and is offered in a 50 ml / 1.7 oz jar.